Instituto Geofísico del Perú (IGP) reported that, during the last 12 months, seismicity at El Misti was dominated by volcano-tectonic (VT) earthquakes. Two seismic swarms (more than 100 events per day) occurred during the last three months, on 19 May and 3 June. An increase in tremor was noted in April, although the total duration did not exceed 10 minutes and was generally low-amplitude. Long-period seismicity was not significant. In the last 15 days, seismicity increased slightly and tremor was recorded daily. Since the last strong eruption in the 15th century, El Misti has experienced infrequent small explosions, some of which were probably merely heightened fumarolic activity. Our most recent reports discussed a steam emission in April 1984 (SEAN 09:05) and vigorous fumarolic activity during 7-8 August 1985 (SEAN 10:12). Weak fumaroles are occasionally detected at the summit area. This report presents basic background and some available recent seismic data through June 2013. Misti's location and its relationship with the nearby city of Arequipa is presented in figures 1-3. Figure 1. These Google Earth images highlight the locations of El Misti and major surrounding landmarks. Courtesy of Google Earth. Figure 2. A mosaic of two astronaut photographs of Misti and the nearby town of Arequipa, Peru, taken on 16 October 2009. The city center of Arequipa is only 17 km SW of Misti's summit. According to NASA, the urban area is bordered by green agricultural fields in the image. The channel in the image NW of the volcano is the Chili River. Arequipa is the second most populous city in Peru, with about one million residents. Courtesy of NASA. Figure 3. Hazard-zone map for El Misti based on the VEI 4 Plinian eruption that took place about 2030 years ago. 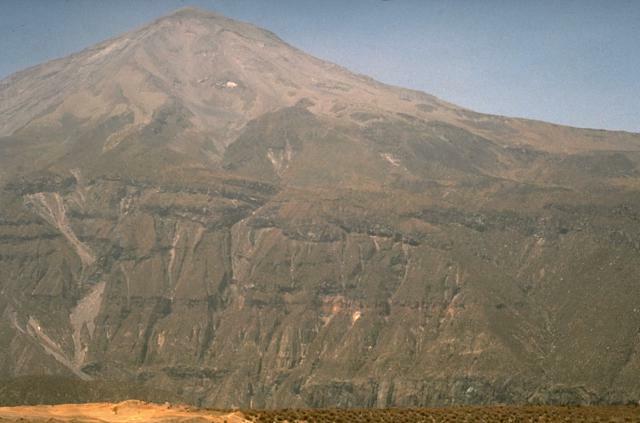 Note that the entire city of Arequipa is vulnerable to pyroclastic surges, and areas closest to the volcano would be at high risk even for small- and medium-sized events. Courtesy of Cobeñasa and others (2012). According to Thouret and others (2001), the maximum fumarole temperature at the lava plug, measured in December 1997, was 220°C. The Geophysical Institute of Peru (IGP) reports on its website that Misti has been monitored daily in real time since 2005 through a network of five seismic stations. Earthquake data for the most recent one-week period is displayed on its website. For example, between 29 April and 5 May 2013, Misti experienced 21 long-period (LP) earthquakes and 163 volcanic-tectonic (VT) earthquakes; between 8-14 July 2013, the volcano experienced 28 LP earthquakes and 104 VT earthquakes. A news account (El Comercio) on 28 August 2012 said the IGP had detected a small seismic swarm during the previous week, the first such swarm in more than five years. During that week, 224 total earthquakes were recorded, 143 of which were VT.
References. Cobeñasa, G., Thouret, J., Bonadonnab, C., and , Boivina, P., 2012, The c.2030 yr BP Plinian eruption of El Misti volcano, Peru: Eruption dynamics and hazard implications: Journal of Volcanology and Geothermal Research, v. 241-242, p. 105-120. Thouret, J., Finizola, A., Fornari, M., Legeley-Padovani, A., Suni, J., Frechen, M., 2001, Geology of El Misti volcano near the city of Arequipa, Peru: Geological Society of America Bulletin, v. 113, iss. 12, p. 1593-1610. Information Contacts: Geophysical Institute of Peru (IGP) (URL: http://www.igp.gob.pe/); El Comercio (URL: http://elcomercio.pe/); and Inca Trail Reservations (URL: http://incatrailreservations.com/). "It is possible that this increase in vapor (no such increase had been noted since April 1971) is caused by the evaporation of water from the rains which have been intense this year and abundant for 3 months, January-March. As the rains ended and the clouds disappeared, the impressive and sometimes intermittent vapor column from the volcano was visible from Arequipa (1,000,000 inhabitants including the suburbs). It cannot be excluded that a notable increase in natural degassing has also been occurring, in combination with the evaporation of atmospheric water. "Persons who intended to go to the bottom of the crater 29 April to collect samples were prevented from doing so because gases irritated noses, throats, and eyes. They said that they also observed flaring, perhaps caused by the combustion of hydrogen or other gases. "The Observatorio de Chacarato of the Instituto Geofísico, Universidad Nacional de San Agustín de Arequipa (10 km from the city and about 20 km from the volcano's crater) equipped with seismographs and magnetometers, had not registered any changes as of 8 May that could be attributed to perturbations of volcanic origin." . . .
Information Contacts: A. Parodi Isolabella, Arequipa. Inside the SE rim of El Misti's [690 x 935]-m summit crater is a younger cinder cone, about  m wide at the top and having an inner crater  m deep, with a flat floor  m across. On 7 and 8 August geologists observed vigorous fumaroles, which had not been active a few months earlier, on the N side of the cinder cone floor. High-pressure degassing, as "noisy as a reaction motor," emitted white-gray vapor from 6 vents. There were red sulfur deposits inside the vents, yellow sulfur outside them. Fumaroles were still visible on the N rim of the crater. The last strong eruption of El Misti occurred between 1438 and 1471 (the reign of the Inca Pachacutec); several weeks of vigorous tephra emission forced residents of the region to flee. Several smaller explosive eruptions have been reported since then, but some were probably only periods of increased fumarolic activity [such as reports from 1878, 1901, 1906, 1929, 1949, and 1971]. Information Contacts: M. Decobecq Dominique, Univ. Paris Sud, Orsay, France. El Misti is a symmetrical andesitic stratovolcano with nested summit craters that towers above the city of Arequipa, Peru. The modern symmetrical cone, constructed within a small 1.5 x 2 km wide summit caldera that formed between about 13,700 and 11,300 years ago, caps older Pleistocene volcanoes that underwent caldera collapse about 50,000 years ago. A large scoria cone has grown with the 830-m-wide outer summit crater. At least 20 tephra-fall deposits and numerous pyroclastic-flow deposits have been documented during the past 50,000 years, including a pyroclastic flow that traveled 12 km to the south about 2000 years ago. The most recent activity has been dominantly pyroclastic, and strong winds have formed a parabolic dune field of volcanic ash extending up to 20 km downwind. An eruption in the 15th century affected nearby Inca inhabitants. Some reports of historical eruptions may represent increased fumarolic activity. Finizola A, Lenat J-F, Macedo O, Ramos D, Thouret J-C, Sortino F, 2004. Fluid circulation and structural discontinuities inside Misti volcano (Peru) inferred from self-potential measurements. J. Volcanol. Geotherm. Res., 135: 343-360. Legros F, 2001. Tephra stratigraphy of Misti volcano, Peru. J South Amer Earth Sci, 14: 15-29. Parodi-I A, 1979. (pers. comm.). Thouret J-C, Finizola A, Fornari M, Legeley-Padovani A, Suni J, Frechen M, 2001. 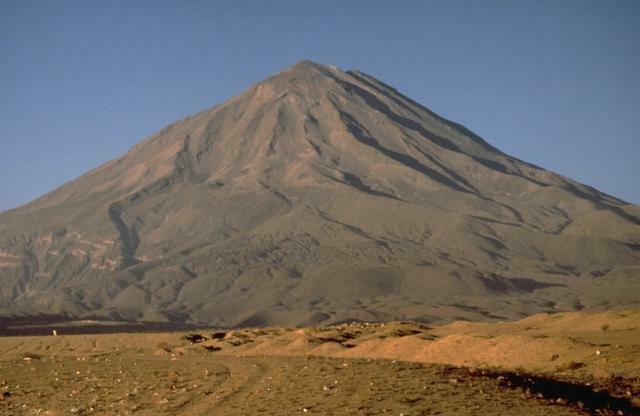 Geology of El Misti volcano near the city of Arequipa, Peru. Geol Soc Amer Bull, 113: 1593-1610. Tort A, Finizola A, 2005. The buried caldera of Misti volcano, Peru, revealed by combining a self-potential survey with elliptic Fourier function analysis of topography. J. Volcanol. Geotherm. Res., 141: 283-297. Wilson C J N, Houghton B F, Kamp P J J, McWilliams M O, 1995. An exceptionally widespread ignimbrite with implications for pyroclastic flow emplacement. Nature, 378: 605-607. There is no Deformation History data available for El Misti. There is no Emissions History data available for El Misti. El Misti, Perú's best known volcano, is a symmetrical stratovolcano that towers above the city of Arequipa. It is seen here from the west at the margin of Arequipa's airport. The modern symmetrical cone has a small, 1.5-km-wide summit caldera containing nested craters. It caps an older Pleistocene volcano that collapsed, producing debris avalanches to the west and SW. El Misti's most recent activity has been dominantly pyroclastic. Historical eruptions date back to the 15th century. The Río Chillos on the NW side of El Misti volcano has excavated a steep-walled canyon that cuts the lower flanks of the volcano. The NW flank of El Misti is somewhat dissected, in contrast to smoother slopes on other sides. Prevailing winds have distributed a thick ashfall blanket to the NE that mantles the distal margins of youthful lava flows. Photo by Norm Banks, 1987 (U.S. Geological Survey). Large Eruptions of El Misti Information about large Quaternary eruptions (VEI >= 4) is cataloged in the Large Magnitude Explosive Volcanic Eruptions (LaMEVE) database of the Volcano Global Risk Identification and Analysis Project (VOGRIPA).